Euro Disney Annual General Meeting date announced and a guide on how to attend. Disneyland Paris announced yesterday that the 2016 Euro Disney S.C.A. Annual General Meeting will be held on Friday 31 March 2017 at Disney’s Hotel New York Convention Centre at Disneyland Paris. The meeting will start at 9.30 a.m. and is open to all shareholders of Euro Disney S.C.A. The preliminary notice of meeting is available, in French only, on the Euro Disney corporate website in the General Meeting page of the Shareholders section. The English edition of the 216 page 2016 Reference Document for the Annual General Meeting can be downloaded here in PDF format. Below is a guide on how to participate in this years Annual General Meeting. This years shareholders meeting might be the last ever held if The Walt Disney Company is successful in their attempt to takeover Euro Disney S.C.A. .
Any shareholder, regardless of the number of shares they hold has the right to attend the Annual General Meeting. You do not need to be a member of the Shareholders Club to be able to attend. The right to participate in the Annual General Meeting is subject to the registration of the shares in the shareholder’s name in the Company’s share register (registered shares) or in a share account kept by a financial advisor (bearer shares) by midnight, Paris time, three business days prior to the date of the General Meeting, at the latest, in this case, by end-of-day Saturday 25 March 2017. How to attend the Annual General Meeting in Person. An admission card will then be mailed to you. You must contact your financial advisor managing your share account who will issue a certificate of ownership which will provide proof of identity and your ownership of shares. A template letter for your Bank or Financial Advisor can be downloaded here. You must indicating your intention to participate in the General Meeting and then an admission card will then be mailed to you. You wish to vote by mail, check the box 1 and follow the instructions. You wish to give proxy to the Meeting Chairman, check the box 2 (do not check box 1 or box 3). The Meeting Chairman will vote YES for all the resolutions. You wish to give proxy to the person of your choice, who will attend the meeting check the box 3 and fill in the contact details of this person. Regardless of the option you chose, do not forget to date and sign. Fill in your last name, first name and address or verify them if they are already written. Only voting/proxy forms that are completed, dated and signed, and are received by Friday 25 March 2017 at the latest by Société Générale –Services Assemblées will be taken into account. If you hold your shares on a bearer form, please include your certificate of ownership with your voting/proxy form. Important: you can give proxy to anybody who will attend the meeting or to a moral entity such as APPAED – Association des Petits Porteurs d’Actions Euro Disney . Be sure that the person will vote as you wish. Don’t forget to inform the person and tell her how many votes you have. The above guide was originally produced by APPAED – Association des Petits Porteurs d’Actions Euro Disney and is reproduced here with their permission. To celebrate its 25th Anniversary, Disneyland Paris® is offering a new and completely redesigned version of the Star Tours attraction. Introducing Star Tours: The Adventures Continue*. Twenty five years ago, Disneyland® Park opened on the edge of Paris, offering millions of Europeans the opportunity to enjoy extraordinary experiences. Since it first appeared in Discoveryland®, Star Tours has established itself as a flagship attraction. Its mission: to take guests on a spectacular voyage to the heart of the Star WarsTM films. new experience, new destinations, a new pilot, new characters, new technologies and more. The attraction returns with an all-new, action-packed intergalactic voyage, all in 3D. Epic. Star Tours: The Adventures Continue* announces the arrival of a multitude of new scenes from the Star WarsTM saga. With more than 70 different mission combinations, it invites guests to enjoy an experience that is unique every flight. They never know where the Force might take them. Guests travel through the galaxy with a new pilot, C-3PO himself! And along the way they meet heroes never encountered until now. And watch out for Darth Vader… each scenario, journey and unexpected development is random to ensure guests can enjoy an original experience every time. With state-of-the-art technology, flight simulators, digital 3D, Audio-Animatronics characters, special effects in the cockpit and epic music, guests are fully immersed in the universe of the Star WarsTM films. Episodes I to VII inclusive. They get ready to join the Rebellion aboard a Starspeeder 1000. The ship is meant to be piloted by droid AC-38, but in the end it is C-3PO behind the controls at take-off. From this point, there are more surprises to come… And while these surprises can help guests meet up with Princess Leia, Yoda, Boba Fett to name a few, one thing is certain: each flight will become a very memorable experience! Star Tours: The Adventures Continue* brings together more Star WarsTM heroes, villains, planets, battles, ships, and even more droids than ever before! The surprises just keep coming! Come to Discoveryland at Disneyland® Park on 26 March 2017… and may the Force be with You! Who are Euro Disney’s shareholders? Following the announcement on Friday that The Walt Disney Company (Disney) intends to purchase 90% of HRH Prince Alwaleed’s stake in Euro Disney S.C.A. from the Kingdom Holding Company, today we take a look at the other corporate investors who own shares in Disneyland Paris. Disney is going to purchase 90% of HRH Prince Alwaleed’s stake in the resort which will occur through an off-market block trade and is scheduled to close on 15 February 2017. This move will increase Disney’s stake in Disneyland Paris from 76.7% to 85.7%. The Kingdom Holding Company has said the net profit gained from this transaction will be $61 million. Disney then propose to launch a voluntary cash tender offer for all the remaining shares in Euro Disney at €2 a share – once the proposed offer has been subjected to review and clearance by the Autorité des Marchés Financiers (AMF). Following the voluntary cash tender offer if Disney then own at least 95% of Euro Disney they will then proceed with a mandatory buy out and delisting of Euro Disney shares from the Euronext Paris stock exchange. Disney has also informed Euro Disney that it is committed to support a further recapitalization of up to €1.5 billion to the Euro Disney group of companies to enable them to continue the implementation of improvements to the resort, reduce debt and increase liquidity for the ongoing s long-term success of Disneyland Paris. So who does own the 783,364,900 shares that make up Euro Disney S.C.A. ? The largest shareholder is The Walt Disney Company who own 600,922,335 shares or 76.7% of Euro Disney via three of their subsidiaries companies EDL Holding Company, EDI SAS and EDLC SAS. Euro Disney themselves own 0.075% of the company with a holding of 584,476 shares. HRH Prince Alwaleed owns a 10% stake in Disneyland Paris via his Kingdom Holding Company. Prince Alwaleed has taken part in a number of recapitalisations of the resort since 1994. Disney through its wholly-owned subsidiary EDL Holding Company LLC has agreed to buy Kingdom’s 9% percent stake in Euro Disney for €2 a share, to be paid in The Walt Disney Company common stock. The remaining corporate investors are a mixture of asset management companies, investment management companies and pension funds. It is expected that these investors will partake in the voluntary cash tender offer if it is approved by the AMF. The remaining 5.5% of shareholders of Euro Disney are individual private investors. These days the majority of them are Disneyland Paris fans who purchased shares to own a small part of the Magic and to take advantage of the perks the Euro Disney Shareholders Club offers to their members. The above list of Euro Disney S.C.A. corporate shareholders was compiled by APPAED (Association des Petits Porteurs d’Actions EuroDisney) using data from the Euro Disney SCA reference document, Wall Street Journal, Barron’s, Morning Star, Financial Times (FT Market), & Zone bourse et AM. This list was published on 7 February 2017. ‪Shares in Euro Disney S.C.A. increased in value today by 67% following the announcement this morning by The Walt Disney Company (Disney) of their intention to purchase all the remaining shares in Euro Disney via their wholly-owned subsidiary the EDL Holding Company. This evening Euro Disney’s share price on the Euronext closed at €2.00 up €0.80 on yesterday’s close of €1.20 following the news that The Walt Disney Company will acquire 90% of the Kingdom Holding Company’s shares in Disneyland Paris at a price of €2.00 per share which will be paid in shares of Disney common stock. The move will increase Disney’s interest in Euro Disney to 85.7%. As a result of this transaction, HRH Prince Al-Waleed Bin Talal ownership interest in Euro Disney will decrease from 10.0% to 1.0%. Disney also announced that the EDL Holding Company intends to make a cash tender offer for all remaining outstanding shares of Euro Disney at a cash price of €2.00 per share, representing a 67% premium to the trading price at the close on February 9, 2017. Disney will also support a recapitalization of up to €1.5 billion for the Euro Disney group of companies to enable the Group to continue implementation of improvements to Disneyland® Paris, reduce debt and increase liquidity. The graphs below show Euro Disney’s share price during the last 12 months. Disneyland Paris published their 2017 first quarter results today 10 February 2017. A summary is below and the full report can be downloaded here. (Marne-la-Vallée, February 10, 2017) Euro Disney S.C.A. (the “Company”), parent company of Euro Disney Associés S.C.A., operator of Disneyland® Paris, today reported revenues of the consolidated group (the “Group”) for the first fiscal quarter ended December 31, 2016. Resort operating segment revenues increased 3% to €345 million, compared to €334 million in the prior-year quarter. Theme parks revenues increased 3% to €194 million due to a 6% increase in attendance as the prior-year quarter was impacted by a four-day closure of the parks following the November 2015 events in Paris. This increase in attendance was partially offset by a 3% decrease in average spending per guest compared with the prior-year quarter. The increase in attendance was primarily driven by more guests visiting from France and the United Kingdom, partially offset by fewer guests visiting from Belgium and the Netherlands. The decrease in average spending per guest was primarily due to lower average ticket rates. Hotels and Disney Village® revenues increased 4% to €141 million mainly due to a 3 percentage point increase in hotel occupancy. The increase in hotel occupancy reflected more guests visiting from the United Kingdom, partially offset by fewer guests staying at the hotels from Belgium and France. Real estate development operating segment revenues increased €5 million to €9 million due to higher land sale activity. Given the nature of the Group’s real estate development activity, the number and size of transactions vary from one period to the next. During the quarter ended December 31, 2016, the Group continued its refurbishment program in preparation of the upcoming celebration of Disneyland® Paris’ 25th Anniversary. The Group notably completed the refurbishment of Big Thunder Mountain which re-opened in December 2016. Completed renovations, which also include “it’s a small world” and Peter Pan’s Flight in the prior year, have enhanced the park’s offerings and contributed to positive guest feedback. In January 2017, Disneyland Paris launched the Season of the Force. For this event, which will last until March 2017, Walt Disney Studios® Park presents a nighttime spectacular which transports guests to the heart of the Star Wars Saga. This show combines live entertainment, special effects and an epic sound and light show projected on the park’s most iconic building. Throughout the day, guests are also able to see heroes from the world of Star Wars as part of a number of events for the celebration of the galactic saga. On March 26, 2017, Disneyland Paris will kick off its 25th Anniversary celebration, which features a new nighttime spectacular, a new daytime parade and exclusive shows. Enhanced attractions will also be launched during the celebration, including Star Wars Hyperspace Mountain and Star Tours: The Adventures Continue. The current year also marks the 30-year anniversary of the signature of the main agreement with the French state, which serves as the foundation for the establishment of the resort. In its announcement of full year results for the year ended September 30, 2016 (“Fiscal Year 2016”), the Group reported a €565 million impairment charge related to its long-lived assets which are mainly comprised of the theme parks and hotels. The impairment charge was recorded in the Group’s consolidated financial statements prepared in accordance with International Financial Reporting Standards (“IFRS”). Separately, each fiscal year the Company prepares statutory financial statements under French accounting principles which are different than IFRS principles. These financial statements are prepared on a stand-alone basis with the Company’s primary asset being its investment in the equity of its subsidiary Euro Disney Associés S.C.A. (“EDA”). On an annual basis, the carrying value of the Company’s investment in EDA is required to be tested for impairment. The impairment tests under IFRS and French accounting principles have both been performed using the net present value of expected future cash flows of the theme parks and hotels. The Company has also used that value to measure its investment in the equity of its subsidiary. On that basis, as of September 30, 2016, the Company reviewed the value of its investment in the equity of EDA for impairment and considered that the value was nil. Accordingly, the Company recorded an impairment charge of €953 million. As a result of this impairment charge, the net equity (capitaux propres) of the Company as of September 30, 2016 has become less than 50% of its share capital. In accordance with Article L.225-248 and Article L.226-1 of the French Commercial Code, the shareholders will be consulted about the Company’s pursuit of activities. For this purpose, a resolution will be submitted for a vote of the shareholders at the next general meeting to fulfill this mandatory requirement. A pursuit of the Company’s activities will require it to restore its net equity within the two-year period provided by law. The impairment charges discussed above had no impact on the Group’s or the Company’s cash position or cash flows. During their meetings held on February 9, 2017, the Supervisory Boards (Conseils de Surveillance) of both the Company and EDA (the “Boards”) appointed Mr. Axel Duroux as Chairman of the Boards to replace Ms. Virginie Calmels, who resigned. Due to the launching of a new national political movement she founded and now heads as president, Ms. Virginie Calmels informed the management company (gérant), on January 27, 2017 that she was considering whether her new responsibilities were compatible with her functions as Chairman and member of the Boards. In that respect, she asked the management company (gérant) to organize the works of the Nomination Committee (Comité des nominations) of the Boards in order to ensure a smooth transition of her positions as Chairman of the Boards in the event she had to resign from such positions. Having been informed by Mr. Axel Duroux and Ms. Catherine Powell of the positive outcome of the works of the Nomination Committee, Ms. Calmels notified the management company (gérant), on February 8, 2017, in the evening, of her decision not to pursue her role as Chairman and member of the Boards and to resign from these positions with immediate effect. Ms. Calmels stated that the media exposure related to her position at the head of her political movement may create a risk of confusion in terms of image for the Company. She also considered that her role within this movement was preventing her from giving to the Company as much time as her positions as Chairman of the Boards require. In this respect, Ms. Calmels emphasized the significant involvement shown by herself and the Boards in order to ensure that the management company (gérant) was implementing measures to cope with the difficulties faced by the Group during fiscal year 2016, due to the depressed economic environment on the one hand, and to the exceptional events which deeply affected the tourism industry during this period on the other. Ms. Calmels also stressed the dedication of the Boards, in each and every one of their works and decisions, to support the actions taken by the management company (gérant) to improve the Group’s position, in the interest of the Company, its shareholders and the Group’s employees, including the one which led The Walt Disney Company to waive its royalties and management fees for two years, in order to reinforce the Group’s liquidity. In this regard, Ms. Calmels noted that it would be necessary to carry on with the efforts made for such purpose. As such she received confirmation from the Company’s main shareholder that it was aware of the financial situation of the Group and that it remains committed to help the Group find and propose, before the end of 2017, the right long-term financial solution for the Group which takes into account the interests of the various stakeholders. Ms. Calmels thanked the members of the Boards, the members of the Group’s general management team and the shareholders for trusting her while she was carrying out her duties. Informed of the conclusions of the works of the Nomination Committee (Comité des nominations) as she had requested, she welcomed the recommendation it made to propose to the Boards to appoint Mr. Axel Duroux as Chairman of the Boards. While it expressed its deep regrets regarding Ms. Calmels’s resignation, the management company (gérant) understands and respects the professional choice she made and the motives for her decision. The management company (gérant) thanks her gratefully for having, during the past few years, actively and constantly taken part in the efforts made to restore the Group’s financial condition, in the interest of the Company, its shareholders and the Group’s employees. The management company (gérant) has informed Ms. Bernis that it deeply disagrees with her perspective, reminding her of the measures taken in the interest of the Company, its shareholders and the Group’s employees, as well as the actions taken by the management company (gérant), under the supervision of the Boards, in order to address the Group’s financial situation. During their meetings held on February 9, 2017, the Boards acknowledged these resignations and, having considered the recommendations of the Nomination Committee, resolved on the ways and means to reorganize each Board. In that respect, the Boards have decided to propose during the next meetings of the shareholders of both the Company and EDA to appoint Ms. Hélène Etzi to replace Mr. Karl Holz, who gave notice of his decision not to renew his term of office, which will come to an end on the date of these meetings. The Boards have also resolved not to replace Ms. Bernis whose term of office was to expire on the date of the next meetings of the shareholders of both the Company and EDA. Ms. Calmels being replaced by Mr. Duroux as Chairman of the Boards, her term of office will not be renewed and the number of the members of the Boards is consequently ten as of today, of which seven are independent. 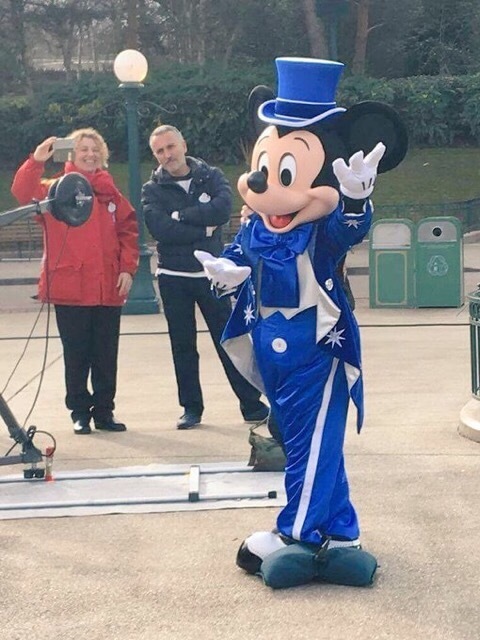 Mickey shows off his 25th Anniversary outfit. 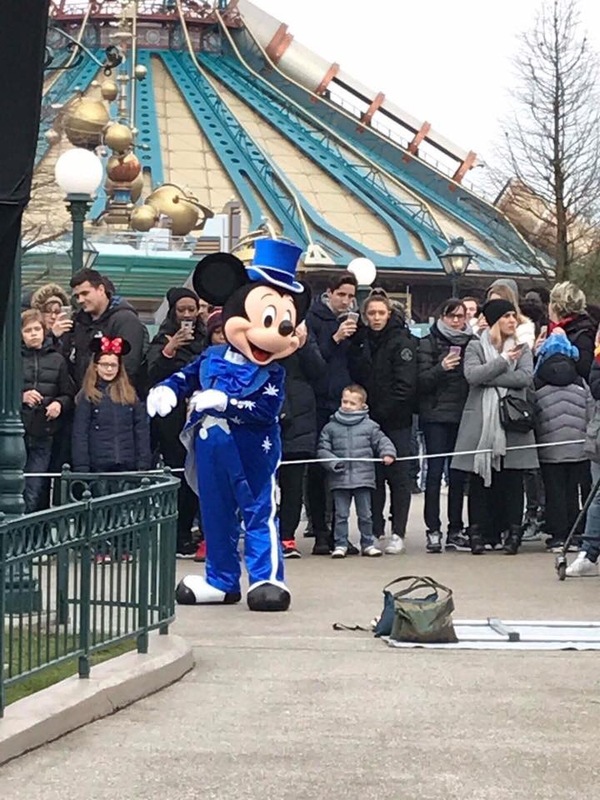 Mickey Mouse made his first public appearance in the park yesterday (Monday 6 February 2017) dressed in his 25th Anniversary outfit for a photoshoot with French television presenter Karine Ferri for TF1.